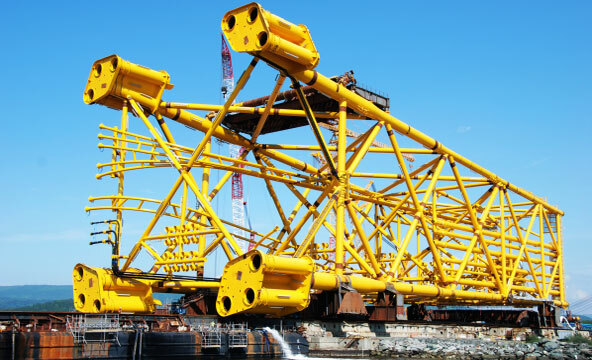 Structural design activities are relevant to revamping of existing fixed platforms consisting of structural adjustment; relocation or insertion of new facilities on the deck, stretching of the design life. Static, modal, harmonic and transient non-linear analysis are performed by the help of dedicated commercial FE software (i.e SACS, ANSYS APDL) that allow to consider the elasto-plastic material behavior to determine the Reserve Strength Ratio (RSR) of the structure. API 2A (WSD and LRFD), RINA, DNV OS-C101,DNV-RP-C203,DNV-OS-C301,DNV-OS-E302 , Noble Denton 0027/ND, 0027/NDI, ISO 19901-1, ISO 19901-3, ISO 19901-2, EC3, NORSOK N-004.